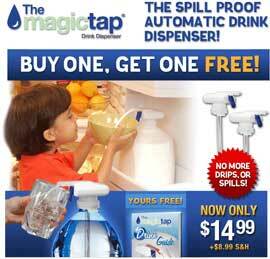 Magic Tap is the spill proof automatic drink dispenser making it so much easier to get your drinks. It fits right over your milk jugs, juice bottles and containers, the silicone universal cap fits most tops. Magic Tap works like a straw sucking up the liquid and with the push of the tap out it comes. No more spilled overs from those heavy jugs. Keep it ready to use in your fridge or on the counter so your younger ones can help themselves. No more crying over spilled milk, Magic Tap saves you money by not wasting spilled drinks.